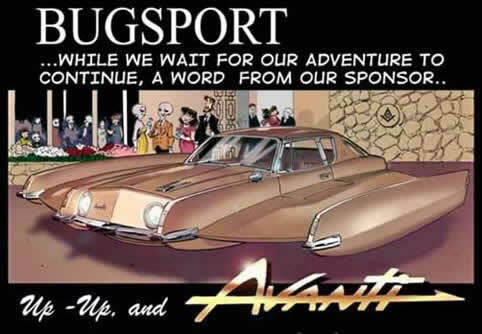 Avanti UFOs Invade Bugsport Maine! Illustrator and cartoonist, Ted Bastien, has created a cartoon adventure that features Avanti and Studebaker flying saucers that transport the alien and human inhabitants of Bugsport, Maine. The alien aircraft portray classic Studebaker details so accurately the different models are instantly recognizable. Bastien parodies one of the familiar Studebaker Avanti dealer postcards substituting his Bugsport cast for the original models. 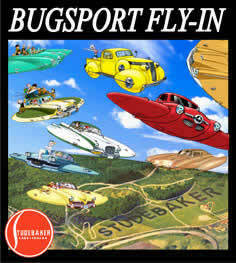 A variety of Studebaker models in flying saucer form fly over Bugsport, Maine. Bugsport Studebaker offers "land and air" vehicles. Copyright 2005 by Ted Bastien. A Ted Bastien parody of a familiar Studebaker Avanti postcard.